Finished it. So cute. Simple construction, using the 5 hole pamphlet stitch to secure 3 signatures inside. I added little strips of red electricians tape across the spine, just to further reinforce the packing tape, although it was well stuck anyway. I just liked the look of it. I also played around with the binding threads tying them with contrasting thread. Not sure I love it but will def. play with the idea a bit more. many with the wallpaper texture impressions. Nothing too busy cause I have an idea for finishing it off. But DOH! How is it DS managed to cram the vast majority of his dirty clothes in one small bag to come home for such a short trip, JUST so I could do his laundry?? And cooking is not the usual one hour process but hours and hours of “special” meals he would never make himself – last night, chicken with whiskey, cream and pecans, tonight beef stew with mash from a friends potato crop. Misshapen but tasty. And of course he held off getting a haircut and new shoes – wonder who he thinks is footing the bill for them? Oh wait, I know…. The point is between all that (and more) and the fact that while working on this I had a massive flash of inspiration that I think is going to be so cool if I can make it work. It’s one of those multi-stage projects, and unfortunately one where any mis-step could ruin the whole thing. It needs to mix craftyness with some technology and I am DYING to get started on it. Off to get DD a haircut and re-style soon, then prep tomorrow for a Halloween party on Saturday. Plus having a go at making DS’s fave dessert, pumpkin pie, but from an actual pumpkin rather than the handy canned puree. Oh the joys of motherhood. My craftyness will have to wait…. 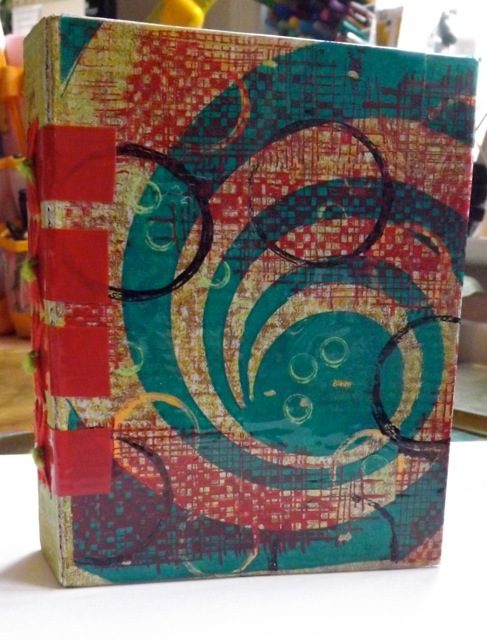 Categories: Gelli plate monoprints, mini-albums | Tags: Gelli plate, mini-albums | Permalink. Great book you’ve made! And with everything you’ve got going on too! Thanks for sharing with the Party! Great book, looking forward to seeing what you are going to do with it as I also have a similar book sitting on my shelf. Ah, the ever expanding laundry bag, a bit like the Tardis me thinks! Love the book and the contrasting thread and I agree the sink mat makes some fabulous impressions. 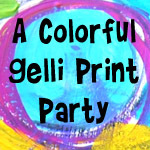 The gelli book looks awesome!! Love your book, thanks for inspiring me. 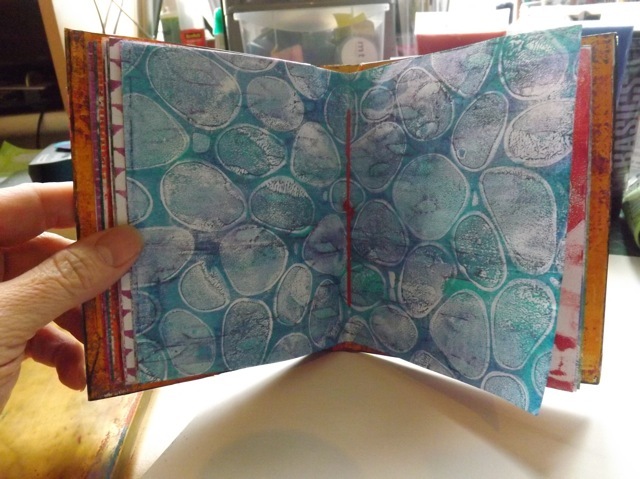 Quick question (excuse me if you’ve already addressed this and I missed it) – do you print on both sides of the paper or are two pages bound together? I print on both sides then fold in half to create one leaf. Each signature (group of pages) is 4 sheets and there are three signatures. je me suis lancée dans la gelli, et je dois dire les premiers essaies sont bofbof mais je persévère!!!! bravo a vous et mesrci pour les explications..
You are too funny! Love your posts…your writing makes people feel as if they know you…are good friends that you are catching up with. 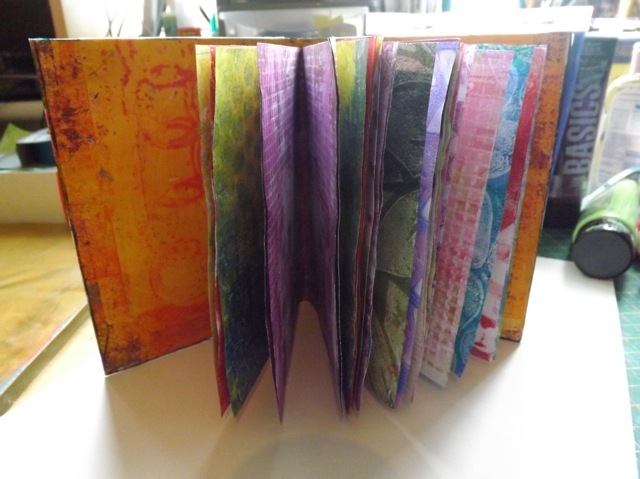 The Gelli book is looking great. 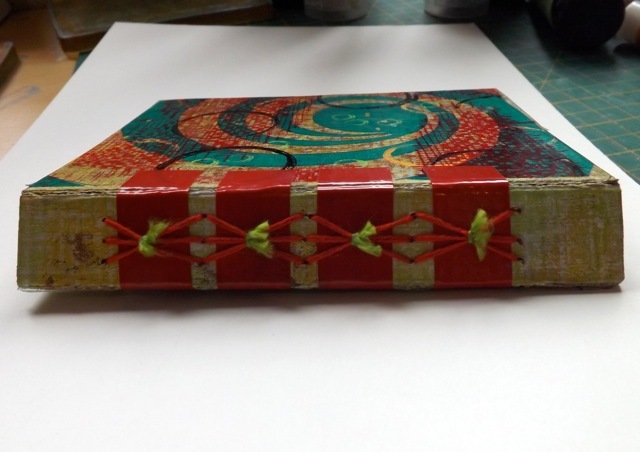 I love how you’ve tied off the stitching on the spine! 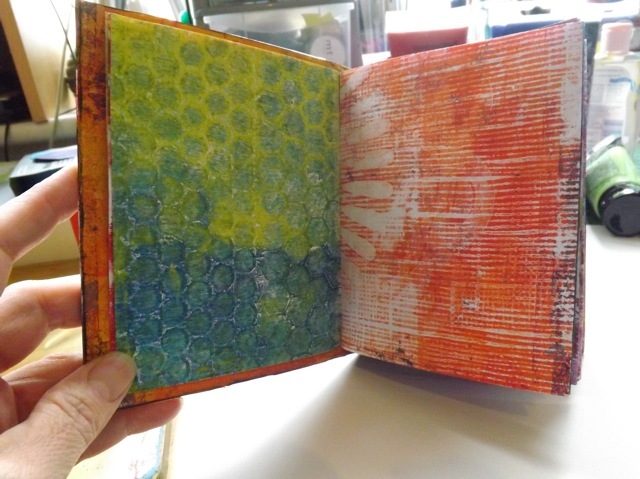 Love the gelli book! So glad you get to spend time with your DS.